I tried this recipe from the book “Ricardo: Meals for Every Occasion”, by Ricardo Larrivée a Canadian celebrity cook/chef from Quebec. I personally enjoy his shows in Food Network Canada, but why I decided to buy the book was because of its design and photography. It is very Canadian in style and has interesting illustrated typography. Of course, it also has great recipes. 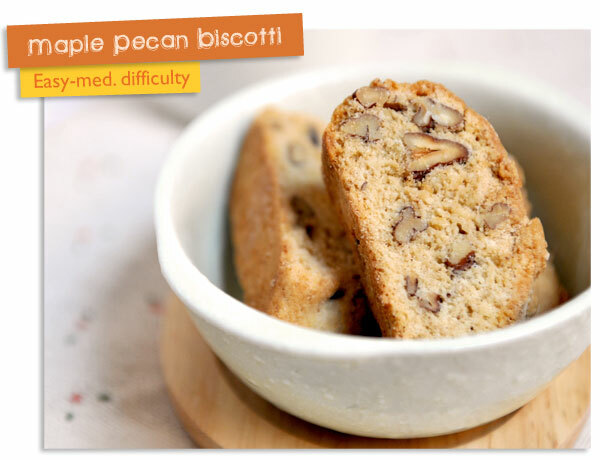 I really like biscotti and this is one of my favourite because it is very good and easy to make. Preheat ovenn to 350°F (180°). Line a cookie sheet with parchment paper. In a medium bowl, combine flour, 1/2 cup maple sugar and baking powder. Add butter and use a pastry blender to cut butter into small pieces. Add egg and mix until a dough forms. Mix in toasted pecans and knead dough with hands. Shape dough into a 20 inch log and place onto baking sheet. Bake for 30 minutes and transfer it onto a cutting board. Let cool for 15 minutes. Brush with milk and dust with the remaining maple sugar. Using a sharp knife, cut diagonally in to 3/4 inch (2cm) slices. Arrange slices on the baking sheet and return to the oven for about 20 minutes. Let cool on a rack. The maple sugar can be pricey to buy but I think it is worth getting because its sweetness is very different from regular granulated sugar – like maple syrup. The flavour of the maple is so delicious with the toasted pecans. I made these with Canadian organic maple sugar but you can use whatever you can find. Try out the recipe some time!